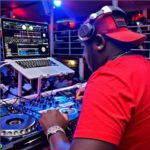 Capital FM’s deejay Joe Mfalme releases a new mix every first Friday of the month and his latest mix dubbed Reggae Revolution is all about those nice Reggae old school vibes. If you love legends like Glen Washington, this hot new mix will keep you jamming and make you reminisce those good old days of jam sessions when Black Supremacy was the hottest Reggae unit in Kenya. Tell a friend to tell a friend that Joe Mfalme has a new gift for Reggae Lovers. You can download the mix here for free. Enjoy the vibes. The post Hot from the kitchen! Here’s Dj Joe Mfalme’s new gift to Reggae lovers. Download for free. appeared first on Ghafla! Kenya.